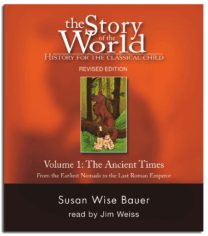 The Story of the World, Volume 1: Ancient Times (5000 BC to 400 AD) – History is a story; Isn’t it time you read it that way? 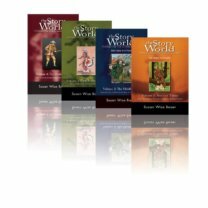 This engaging guide presents world history in a narrative format. What terrible secret was buried in Shi Huangdi’s tomb? Did nomads like lizard stew? What happened to Anansi the Spider in the Village of the Plantains? 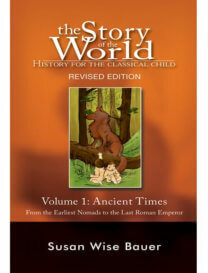 And how did a six-year old become the last emperor of Rome? 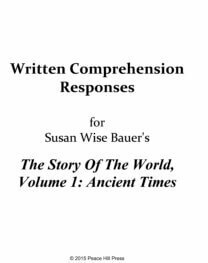 Susan Wise Bauer leads you on a fascinating journey through the cultures, conflicts, and ideas that continue to shape our world. 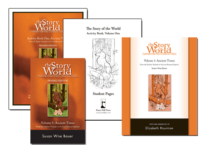 This read-aloud book is designed for parents to share with elementary-school children, or for older readers to enjoy alone. (Pick up the audio version for those long car trips…unless you prefer keeping “Everything Is Awesome” on an endless loop, in which case we wish you well and may your earplugs be sturdy). 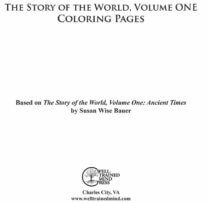 Turn it into a full-year curriculum with the accompanying Activity Book, which provides coloring pages, map exercises, review questions, reading lists (fiction and nonfiction), research ideas, and fun projects (the “mummified chicken” is a popular one). Parents of older students (4th grade and up) can use the Tests to evaluate progress, with multiple-choice, short answer, and essay questions for each chapter.